In Xorro-Q, a Group is a set of Participants who are associated for the purposes of performing the same activities. In the education sector, a group is closely analogous to a course, or a class of students. A Group has a Group name (most often the course name), and confers on its (participant) members the right to join activities which are specifically targeted to that group. 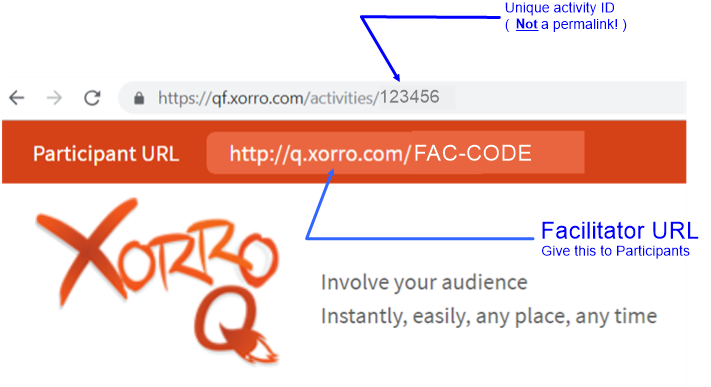 In Xorro-Q, there is no relationship between a Group and a Facilitator: a Facilitator can, by assigning activities to a Group, gain access to Results data associated with members of that group. When using Xorro-Q it is not obligatory to organise participants into Groups, however doing so does greatly enhance reporting and managing access to activities. For instance, when an activity is run, access to the activity may be limited to those participants who are members of a selected Group. Reports are created which indicate performance metrics for an entire Group, for example attendance and engagement metrics, or gradebook outcomes. Some of these reports depend on the Group organisation. For this reason, if output reporting is important then we recommend that participants be organised into appropriate Groups and that every activity should be associated with a Group. In Xorro-Q, Participants can be organised into Groups (a "Group" being analogous in education to a "course" or a "class" of students). Each Group may then be subdivided into sub-groups of Participants, known as Teams, in which any Participant can only be a member of one Team (within a Teamset, see below). A particular arrangement of a Group's Participants into Teams is known as a Teamset (ie a set of teams). A Teamset is automatically created whenever a Group of Participants is organised into Teams. Any later change in the composition of team members means a new Teamset is created. Teamsets are automatically named and saved by Xorro-Q, so that it is possible to distinguish between the Results from one teamset compared to Results from another Teamset in the same group. A Group might have multiple Teamsets (for example, different team organisations for different purposes, or the same general organisation but with team membership changes over time). Where there is more than one Teamset in a Group, a participant might be associated with multiple teams. When launching an activity which involves teams, the Fsacilitator will be required to identify the relevant Teamset (where more than one exists in the group). Any results will then be tied to that teamset. A lecturer (Facilitator) sets up a Group in Xorro with the same name as a course she is running. Jeff, Janet, Jill and Joan are in Team J.
Larry, Lucy, Leonard and Lyell are in Team L.
An activity is run, and associated with this Teamset. Jeff, Janet, Jill and Larry are in Team J.
Joan, Lucy, Leonard and Lyell are in Team L.
The Results from the first activity are still associated with the first Teamset20181001. Q-Bank is Xorro-Q's bank of questions which is accessed and managed by the Facilitator. A Facilitator can add questions to Q-Bank, keep his or her questions private, or share questions with others either in the institution or globally. In Q-Bank, questions can be tagged to make them easier to find. They can also be organised into categories and folders. Although questions are usually created from within an Activity, they can then later be selectively added to Q-Bank, and thus organised for later use. 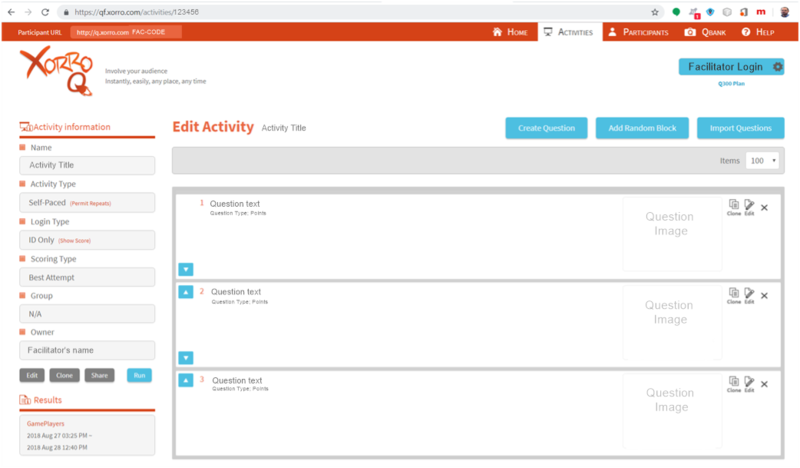 There is a question editor within Q-Bank that allows questions to be edited without placing them into an activity. Using Q-Bank to Find and Manage Questions .. What do the terms "Mine", "Institution" and "Global" mean in the Q-Bank sharing and search functions? .. How can I import quantities of questions into Xorro-Q? .. I have imported questions from a third party source (eg a publisher). Can I share these with other facilitators? A Peer Assessment is a special type of self-paced activity featuring a survey of prepared questions asked of every participant. Each participant is asked questions designed to evaluate the performance of other members in the participant's team. Self-evaluation is also included in the process. A third party application, Peer Assess Pro, is used to provide survey management, analyse the participants' responses, and supply outputs appropriate to the Facilitator and to the individual participants. A Peer Assessment activity requires that the group associated with the activity includes team membership and email information, specified in columns 'team' and 'email'. Every participant in the group must be assigned to a team, and only to one team (in that group). What is the Purpose of Peer Assessment? What questions are asked in the peer assessment survey? 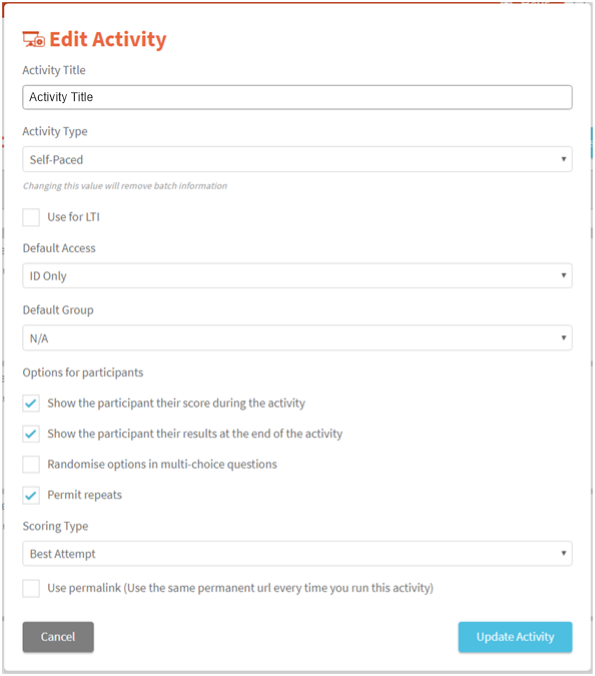 An activity permalink can be generated for any self-paced activity from the activity edit page. From the Activity Information bar on the right side of the page, select the "Edit" button (see image, right). At the bottom of the Edit Activity form (see image, below) place a check mark at "Use permalink... "
The label will then be replaced with a field displaying the permalink for this activity. This URL will take the form: http://q.xorro.com/Fac_code/p****** where "Fac_code" is the Facilitator's code and "******" is the unique (numeric) id for the activity. The activity url is the URL associated with an activity when it is run. This is the url at which a participant will access an activity. ###### is a unique numeric string generated for the activity. Xorro-Q is a real-time audience response solution designed to make presentations, lectures and lessons more involving. Xorro-Q involves a site where Facilitators can prepare activities in advance (the "QF" site" - http://qf.xorro.com). Once in session, the Facilitator can "run" the activities from this site also, or can optionally choose to run them from a desktop launcher application, the Q-Launcher. Participants join the session by browsing to the Facilitator URL. This is generally a suffix following the address http://q.xorro.com/<FACILITATOR_URL>. Xorro-Q Launcher is a desktop application used to launch Xorro activities in session. In this capacity, it is generally used by the Facilitator instead of the Xorro-QF web site. Xorro-Q Launcher provides a simple collapsible toolbar to launch Instant Questions, and a storyboard allowing the Facilitator to select and launch a pre-prepared question or batch. Q-Launcher's dashboard is very space economic, and provides very effective process management during the session. Most importantly, Xorro-Q Launcher collapses into a small floating tile which can be accessed at any time during a presentation or lecture. Xorro-Q Launcher is not essential to using Xorro-Q, since all of its functionality is also available to the facilitator through a browser at the QF web site. By choosing to use Xorro-Q Launcher, the Facilitator can focus the display on other contexts such as a slideshow or video or working document, rather than having the display occupied by a browser displaying the QF web site's activity running page. Xorro-Q Launcher is available for Windows and Macintosh computers. QF Site refers to the Facilitator portal located at http://qf.xorro.com. At this site the facilitator can log in to create activities, run activities, view results from past runs, and organise participants and groups. In Xorro-Q, the Institution is that group of Users which share a common business interest. Typically, in a tertiary education setting the Institution will be a Faculty, while in a K-12 environment the Institution is generally a school. In corporate or Government settings, the Institution is the business unit. These boundaries are relevant, since Activities and Results can be shared by Users around the Institution, and Administrators have access to all data and reports attached to the Institution. Administrators are Users with selected privileges, and frequently perform tasks such as importing participant lists and groups, or extracting reports. Typically, Administrators also assign Facilitator licenses to selected Users, thus enabling those Users to run live sessions with Participants. A Facilitator is a User who has been assigned a Facilitator license in Xorro-Q and therefore is enabled to launch Xorro-Q Activities for participants to access. In Xorro-Q, a Facilitator is anyone who wants to work with a Group of Participants, through an Activity consisting of a series of questions or challenges. For example, a Facilitator might be a lecturer, teacher, trainer or presenter. In Xorro-Q, a Participant is a person who accesses an activity and submits responses to questions in that activity. In the education sector, a Participant is analogous to a student, or a trainee, or a learner. A Participant's true identity is not necessarily known to the Facilitator of the activity: this will be the case if the activity has been set up to allow the Participant to access it using an Alias. In most cases however, the Participants' identities are important for the purposes of tracking their responses over time. In this case, Participants are required to access activities using a unique ID. Participants are usually organised into Groups (analogous to courses, or classes) for the purposes of reporting on results from activities. Participants can also be organised into teams within a Group. Self-Enrollment (if the Institution permits, a Facilitator can create Group which accepts self-enrolling Participants). Assumed name created by a Participant for a single session. An alias is obviously known to the Participant, but may or may not be disclosed to other participants and the Facilitator. For this reason, an alias is generally used where participant anonymity is desired. Because Xorro cannot match an Alias to a specific participant, there is no multi-session tracking of alias records. Identifier used by a participant. Example: ID to Sign In or Log In. ID is associated with the Participant record in Xorro. ID can be imported with the Participant record, or added later. An Activity is "Launched" or "Run" by the Facilitator to make it available to Participants. At this point the activity is termed a Running Activity. At the end, the Activity is "Finished" by the Facilitator. Note that in the case of a Real Time activity, this does not mean that a Question (or Batch) is started; if a Participant logs in to an Activity in which there is no Question in progress, then a "Waiting for Question" page will be displayed. A Question is a component of an Activity. It is intended to cause Participants to respond in some way. Questions may be prepared in an activity before it is run (pre-prepared questions) in which case they can be chosen and asked at the appropriate point during the session, or a question may be "asked" instantly while the activity is running ("Instant Questions". A Batch (or Question Batch) comprises of multiple questions which have been grouped (into the Batch) when preparing the activity. A Batch is specific to Real Time activities, where questions are chosen and "asked" (ie launched) one at a time by a Facilitator at an appropriate time in the session. Instead of "asking" each Question, the Facilitator may prefer to group the Questions into a Batch and thus "ask" the Batch. In session, when a Batch is chosen and "asked", Participants then progress through the several Questions in the Batch at their own pace submitting their answers as they go. The Facilitator can "stop" the Batch at any time. An Instant Question is one asked without preparation. All it takes is one press of a button to ask an Instant Question at any time, and to gain an immediate response from participants. This opportunity for spontaneity and flexibility, and the ease of using Instant Questions, make these a very popular tool in class - particularly in combination with Xorro-Q's Q-Launcher. In Real Time activities, a Question or a Batch is "Started" by a Facilitator, at which time it becomes available to participants to answer. At this point the Question is referred to as "In Progress". The Question remains available for answering until it is "Stopped" by the Facilitator, whether or not the Facilitator chooses to share the "Result". When a Participant logs in to a particular Self-Paced or Real-Time activity, Xorro-Q reports that participant as "attending". This metric is particularly useful where an activity is assigned to a group. In such a case, the attendance can be assessed relative to the possible attendance (logically, the total number of people enrolled in that group). When applied to a time interval, Attendance is determined by assessing the maximum potential logins to each activity in the interval, and dividing this into the actual logins recorded. Participants who are "attending" can then be assessed for their Engagement in an activity. Participants who are "not attending" cannot be assessed for their Engagement on the engagement scale. Example: Group X has 150 participants enrolled. 2 activities are offered in a specified interval. 120 participants login at the first and 100 login to the 2nd. This results in an average "Not Attending" score of 27%. In Xorro-Q, a Result can refer to the Result of a question asked of Participants within an Activity. A Result can also refer to the record of all questions asked. A Result from a Question asked can be displayed by the Facilitator during a Real Time session. In this case the Result does not disclose individual participant's contributions (unless desired by the Facilitator). The Result is the record of an Activity which has been run with Participants and for which answers have been given to question asked. Thus a Result provides a log or report of what questions were asked and what answers were given by which Participants along with dates and times of these events. In addition, the Result records scoring information. A question asked once of a single participant is termed a "Question Impression". If there are ten participants in a group which is asked a single question, then in total there have been ten Question Impressions. If there are three questions asked of the same group of ten participants, then there have been thirty Question Impressions. Note that Question Impressions depend on participants logged in at the time that the question was asked. If a participant joins an activity late, then Question Impressions will not count that participant for those questions asked prior to his joining. The submission of a reply from the participants to a question asked by the facilitator, is called an Answer. The Participation Rate is defined as the Total Answers divided by the Total Question Impressions. An activity consists of a single question, asked of 820 participants. 650 Answers are received. The Participation Rate PR = 650/820 = 79%. In the month of March, Group "X" (total enrolment of 165 participants) was asked a total of 48 questions by 6 different facilitators in 12 different activities. Considering the number of people from Group X actually attending each activity and present when each question was asked, the total Question Impressions amounted to 6960. Across all activities, a combined total Answers amounted to 5825, yielding a PR=84%. This participation rate is of course an average applying to the entire period (a month) and to all the Facilitators and activities run by them for this group in that month. In Xorro-Q, engagement is measured through comparing answer counts to question counts. The idea is to judge to what extent an individual or an audience chooses to participate, by answering questions when these are offered. Each Question Impression is one opportunity to participate; each Answer is that opportunity taken. This approach is applied to an Engagement Scale reflecting the degree to which an attending participant commits to answering questions offered. This scale starts with "initiating", followed by "participating", and then "engaging". "Initiating is the first stage of the Engagement Scale. A Participant who has logged in to an activity (ie is "attending"), but answers less than 20% of all questions offered, is described as "initiating". "Participating" is the second stage of the Engagement Scale. A Participant who answers more than 20% but less than 80% of all questions offered, is described as "participating". "Engaging" is the top stage of the Engagement Scale. A Participant who answers more than 80% of the questions offered is described as "engaging". In Xorro-Q, the Engagement History refers to how the engagement metrics have been changing over a specified interval of time. Xorro-Q makes an Engagement History chart available for any Group, any Facilitator, or any Participant. In Xorro-Q, Engagement Comparison analyses are available by Group, by Facilitator and by Participant through selection of the appropriate filters. These comparisons display participant behaviours averaged across groups and across intervals according to filters specified. The Comparisons describe what proportion of an audience (averaged as determined through the filters) is attending, initiating, participating or engaged. Necessarily, the audience is divided into these four discrete groups and the four values sum to 100.